The Ulster Fry, the Traditional English and the Bacon Butty, all breakfast staples and hugely popular go to meals when you need something filling to start the day. 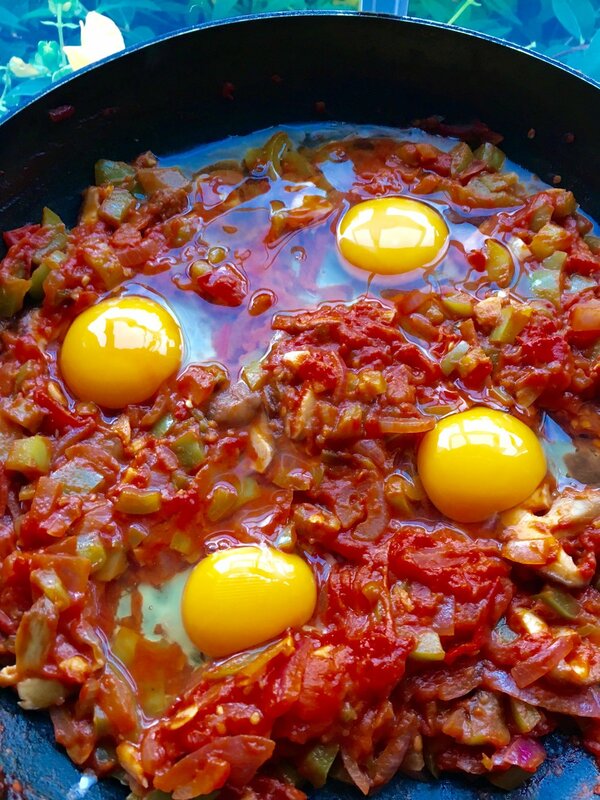 However if you are looking for something that packs a little more punch with your coffee Huevos Rancheros is an excellent and healthy alternative. Basically meaning Ranch Eggs the dish is a traditional Mexican breakfast served with tortillas and salsa. I've put a slight Irish twist on it by using potato rosti rather than tortilla and also adding some bacon as no cooked breakfast should be without bacon. 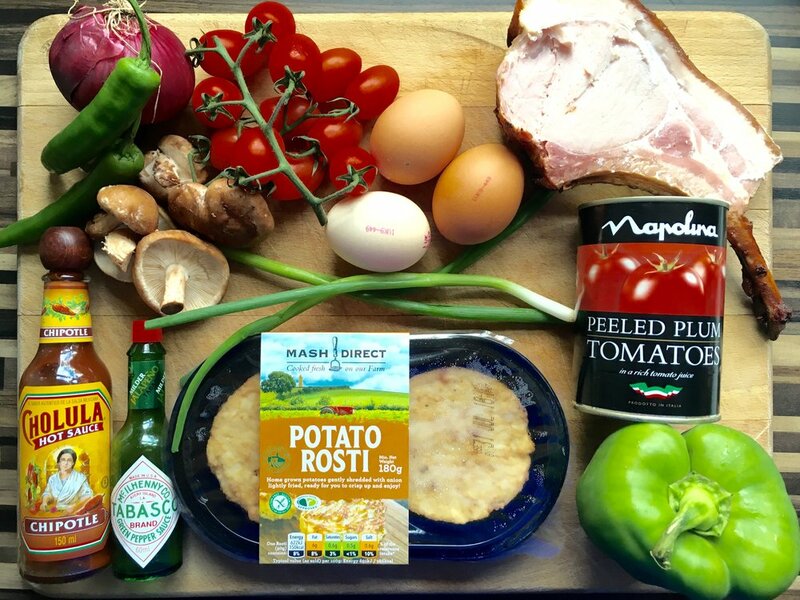 First of preheat your oven to 200°c for the potato rosti's and cook for 20 mins. For the salsa chop the cherry tomatoes into quarters and fry on high heat for 3 minutes. You are aiming to slightly caramelise the tomatoes to release their sweetness. Next finely chop the red onion and pepper, reduce the heat slightly and mix with the tomatoes and cook for a further 3 minutes. 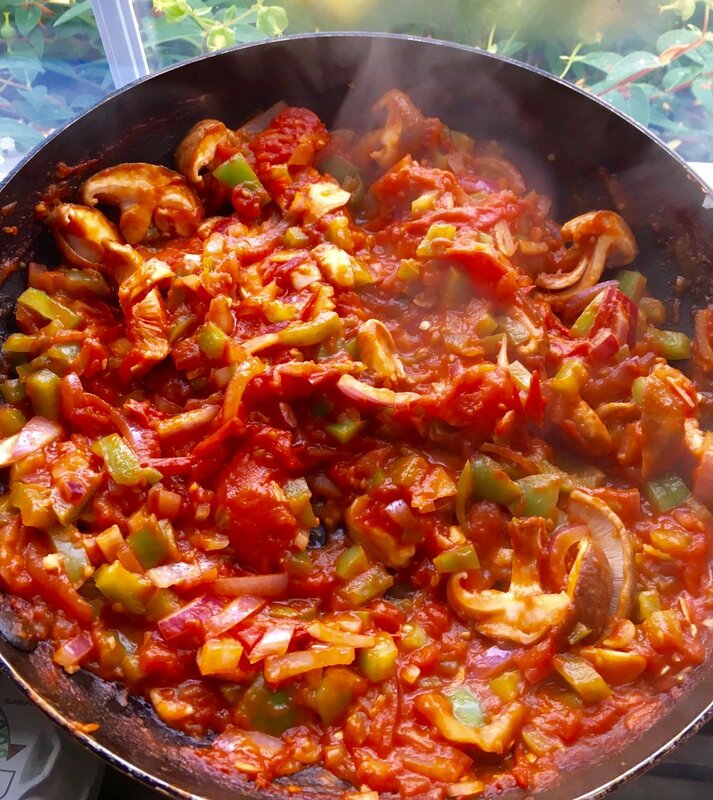 When the onion and peppers have softened add the chopped mushrooms, jalapeno peppers and spring onions, fry for a further minute before adding the tinned tomatoes and hot sauces. The Chipotle sauce adds an excellent smokiness to the dish while the Tabasco adds a tangy back ground heat. I like it spicy but use as little or as much as you wish. Combine the ingredients and stir for a further 3 minutes until you reach a thick salsa like consistency. For the eggs make small holes in the salsa and crack them in. The holes will ensure the eggs are in contact with the base of the pan and also ensure the whites don't run (to much) over the salsa. At this stage reduce the heat and cook the eggs until they are soft in the middle. The idea is to have runny yolks which are then mixed with the salsa, rosti and bacon when the dish is served. For the bacon I used a bacon chop I had previously cooked which was roughly chopped and served on the side. However if it needs cooked you can add it at the beginning before the cherry tomatoes. The fat from the bacon will also add excellent flavour! Serve with the potato rosti and garnish with chopped chilli and spring onion which will add freshness to the dish.